In our last article, we wrote on how to access blocked websites like Orkut, Youtube, Myspace, Facebook, etc. using proxy websites. Most of these proxy websites are vulnerable to security risks as they are not SSL secured and as open to the service providers. Proxy websites just only act as a mediator between us and the target website or service. At the same a VPN ( Virtual private networks ) is operated in a secured medium. VPN services first encrypt our data and associates a custom key or wrapper and transfer over the internet. The data is then decrypted at the end of the VPN end point and transferred to the web service So in between this transfer none will be knowing your personal details, and you will get all benefits of using a proxy. So by using VPN service, we can hide our IP, login username, password, credit card information, etc. in an extra secured environment. Furthermore, you can use VPN services to fool ISPs and bans employed by countries to particular websites. There are both paid and free Virtual Private networks. Here we have collected few VPN networks that you may use for accessing private services. These free VPN services will have some limitations on download quantity, bandwidth, etc., But they are good if you’re looking only for browsing purposes. ALONWEB free VPN service: Complete registration, download and install Alonweb OpenVPN client for Windows. 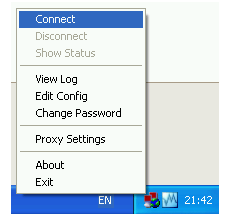 After instillation click on icon from system try and connect Enter username and password registered with service. Now VPN will be established. ALONEWEB will now let the user to surf anonymously and download by bypassing country and ISP firewalls. But free service is limited to 1GB monthly traffic share. Loki free VPN service : Loki is yet another free and SSL secured VPN service for Windows OS . Here you don’t any site registration to access VPN service. A guest role is enough to use there VPN servers located at different parts of the world. 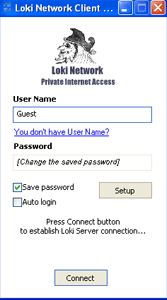 Download Loki VPN client and install. Similar to that in ALONEWEB VPN, click on connect button and establish a secured connection to access blocked websites on a secured mode. A good and reliable free VPN service that I use personally is Cyberghost VPN. I got a user name and password for the service though a promotional offer and so far it is working great. You can try their free version here. I’m using vpntunnel to surf anonymous it cost only €5 a month for unlimited bandwidth. Would you pleas send me VPN USER & PASSWORD . would you please send me username and password for vpn connection? 3 Euro enough for 120 hours online with VPN. Hi can you plz send me a free vpn username and pw ? how can I find username and password for VPN? hi sir i need a vpn could you please send me an username and password?